What Is Assistive Listening and Why Do You Need It? About 15 percent of adults in the U.S. report trouble hearing. For them, as well as many children, going to the theatre, museums, or the movies, and many other places that rely on audio communication—can be frustrating and disappointing. Visitors who struggle to hear the conversation, strain to understand the tour guide, or wonder why everyone else is laughing may have a bad experience and might even choose never to come back. Johns Hopkins University estimates that the number of Americans 20 years and older who suffer from hearing loss will double over the next 43 years, so it’s likely that even more of your customers and visitors will struggle to hear. To create the best customer and patron experience, you want to provide an inclusive listening experience. By improving speech intelligibility, you will be able to boost participant satisfaction and participation. Assistive listening devices help you not only meet ADA compliance standards, but overcome audio challenges like bad acoustics and distracting outside noise. 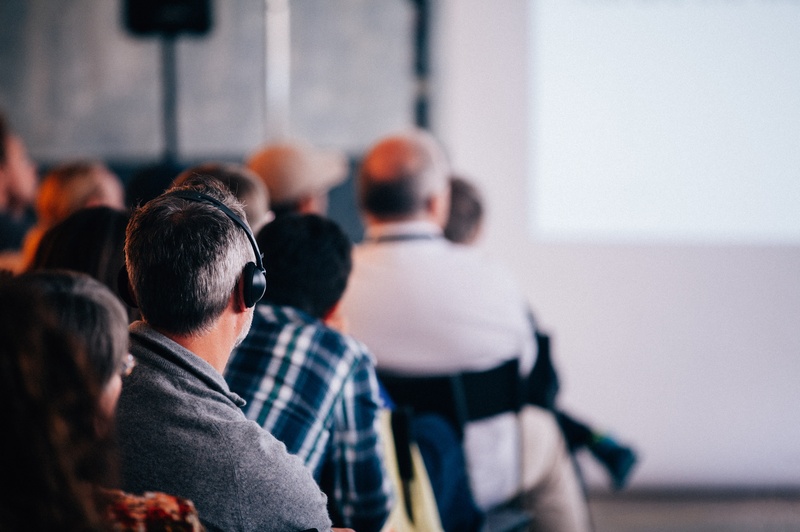 These devices can ensure your customers or audiences will enjoy clear audio and a better overall experience with your organization, whether it be at a sporting event, college lecture, musical performance, or anywhere else it’s important to hear. How Does Assistive Listening Work? Assistive listening requires a system of several audio and listening devices working together. The first component is the audio source—a presenter’s microphone or an AV system, for example. The audio source is routed to a transmitter that receives and amplifies the audio. The transmitter then broadcasts the audio to any associated receivers or devices—such as an enabled smartphone—in the area. The receivers pick up the audio and route it directly to the listener through ear buds, headphones, or an enabled hearing aid or cochlear implant. The right combination of devices and technologies depends on the type of experience you are trying to create and the type of space you are in. When Should You Use Which Assistive Listening System? How it works: Radio frequency, or RF, assistive listening systems work like radio stations using radio frequencies to transmit audio from a source to a receiver, usually provided by the venue and worn on a lanyard around the listener’s neck. For example, the ListenTALK RF system from Listen Technologies includes headsets with microphones for the presenter and individual transceivers that can be distributed to listeners. Radio frequency can travel great distances and is not impeded by walls or other physical obstructions, making it perfect for large venues, including those outdoors. How it works: Infrared or IR systems use infrared light to broadcast audio to listeners with IR receivers. Because IR systems are light-based, they cannot transmit audio outside of a designated space or room, making them ideal for smaller areas such as classrooms or meeting rooms. An IR assistive listening system is also a good choice when proprietary or confidential audio is being shared, since it can’t be intercepted in a hallway or adjacent rooms. Listen Technologies recently equipped Kingsbury Hall at the University of Utah in Salt Lake City with an IR assistive listening system. The infrared system not only provides a clear listening experience, it isolates the audio signal and prevents it from being transmitted outside the center, protecting the copyright of every performance. How it works: Hearing loop technology uses an electromagnetic field to broadcast audio to anyone within range who has a cochlear implant, a telecoil (t-coil) equipped hearing aid, or a loop receiver. This is a great solution for places where hearing impaired individuals are just passing through—like a transit center—or where they will be spending a lot of time—like their home—because it doesn’t require any additional equipment. The audio is broadcast directly to the user. It is also the preferred solution for members of the hearing impaired community. How it works: Audio via Wi-Fi provides users with a more personalized listening experience. Venues can stream multiple audio sources over their network and directly to a user’s smartphone or tablet. All it takes is a free app to access the audio—for example, the Audio Everywhere app from Listen Technologies—and Bluetooth-enabled hearing aids. Listeners can choose what stream they want, and the businesses providing that audio, like a bar or restaurant, can easily scale their distribution to increase the number of audio channels or the number of listeners. The short answer is: everyone. Creating an inclusive listening environment is the law, but assistive listening devices and systems can help more than just the hearing impaired. Bad acoustics, outside noise, and distance between the audio source and the listener can all degrade the listening experience for anyone. And assistive listening technology can overcome those barriers for everyone.